Clickback MAIL is the Ultimate Tool for Bulk Email Marketing. Clickback MAIL lets you send bulk email campaigns to unsolicited contacts. It cleans your list of bad data and spam traps and audits your email content in real-time. Start generating more B2B leads for your business with email. Fill out the form for a free 1-on-1 demo. Clickback MAIL is email lead generation software that's different from traditional marketing automation and email service providers. It was built specifically to enable you to run powerful, effective cold email campaigns. It lets you send 100% CAN-SPAM (US Anti-Spam Law) compliant email campaigns to your cold or purchased B2B contacts. Clickback MAIL also filters out detected Canadian and European emails to ensure your campaigns remain CASL (Canada Anti-Spam Law) and GDPR (EU Privacy law) compliant. It safeguards your domains and IPs, runs your list through filters and hygiene checks, audits your content and more. Recipient list cleaning on import: Your email lists are run through a variety of comprehensive filters, health and anti-spam risk checks to weed out bad data and spam traps for improved deliverability. 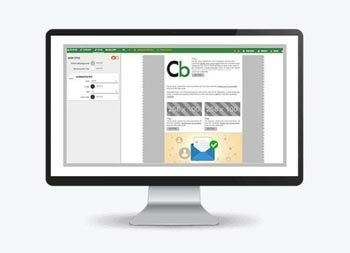 Easy message creator: Clickback MAIL's built-in email editor lets you design professional emails that look great and get opened. You can use a variety of professionally-designed templates, or use the drag-and-drop editor to create your own. Advanced HTML editor: Whether you prefer to edit pre-existing templates or create brand new designs from scratch, you can create your emails directly using HTML. Automatic content audit: Your email content is run through a number of anti-spam checks in real time, and Clickback MAIL will alert you of any potential words, links or formatting that could negatively impact your deliverability. 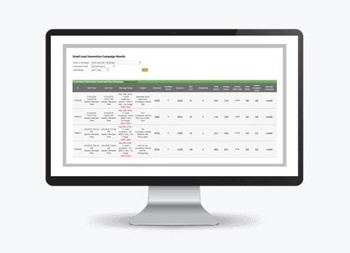 Tailored reports: Clickback MAIL includes powerful reporting tools so you can easily view and analyze key data about your campaigns, such as open and click-through rates. IP and domain safeguards: Clickback MAIL uses its own dedicated IP addresses when sending your cold email campaigns. When sending emails, your sender reputation will remain untouched. When you fill out the form above, you'll receive a link to a calendar where you can schedule your demo at a convenient time. One of our experts will give you a 1-on-1 live demo of Clickback MAIL. You'll get a walkthrough of the features, see how to set it up and learn some strategies and benefits of using it for cold email. A demo usually lasts approximately 30 minutes, and you will be able to ask any questions you may have as well. "I've used Clickback for 3 years now as a key component of our integrated sales and marketing process, both for Akela Partners and for our clients. Cold email marketing is an effective advertising tool when done correctly and through Clickback, we can provide the sales team with timely lists of warm leads. Plus, the team at Clickback is wonderful to work with." "I run a Financial Public Relations firm that relies heavily on email-generated leads. I began using Clickback MAIL 18 months ago and experienced a significant growth in my Lead Generation campaigns. Now I recommend Clickback to all my new clients who are looking to grow their shareholder base. I highly recommend Clickback MAIL to those looking for a creative way to generate new leads." "We have been working with the Clickback team for over 10 years and will continue to do so for another 10+. They are reliable, helpful, suggestive and are always there to support and guide us on any project we do with them. They are always responsive to our needs and their support is second to none. We use them to send out thousands of emails per month and we would endorse them to any company that needs email support and services." 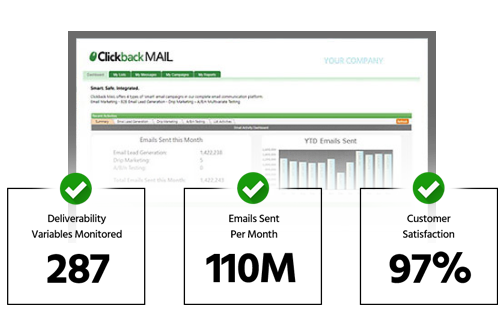 Clickback MAIL is next-level email lead generation software built specifically to enable powerful cold campaigns. Outbound email marketing is one of the most practical and cost-effective ways to bring prospects into your lead funnel. 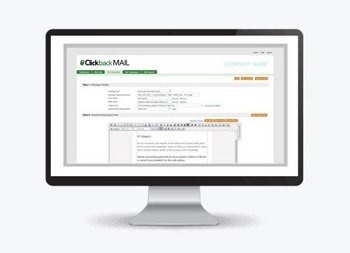 Clickback MAIL lets you build and send 100% CAN-SPAM, CASL and GDPR compliant email campaigns to your cold or purchased lists. It provides industry-leading deliverability thanks to advanced features such as list cleaning, IP and domain safeguards, content auditing and much more. Clickback MAIL features a built-in list verification service, which runs your lists through a variety of health and anti-spam checks. This results in a significantly lower bounce rate. Our email editor includes a unique, advanced spam checker tool that audits your email content in real-time. It alerts you of any words, links or formatting that could hinder deliverability. Our top-notch customer success team is on call to provide you with the best user experience possible, whether via phone or through email.